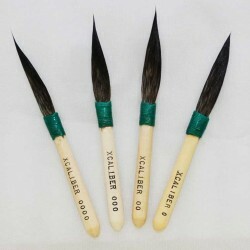 series-Xcaliber Sword Pinstriping Brushes are special due to thier short hair length. Only 1 1/2" vs. the average 2" and 2 1/4". This shorter length allows greater control for intricate designs as well as long lines. Only the finest imported blue squirrel hair is used, along with its hard wood handle, Available in size 0000, size 000, size 00 and size 0. Hair Length Out 1-1/2" long. More information and pricing on series-Xcaliber Sword Pinstriping Brushes listed below. series-Xcaliber Sword Pinstriping Brushes: Sword's longest hairs on top (tip) and tapers back to a shorter lenght on the underside by the handle. The sword brush originated on the early assembly lines, used mainly for automotive paint touch-ups. Over the years, brushes have evolved to better suit pinstripers' needs, with short and long handles, large and small bellies (the middle section where the paint is carried), and different kinds of hair - squirrel hair being the most commonly used. Pinstriping Brush Cleaning and Care: Always clean out pinstriping brushes well using the proper solvent or thinner for the paint your using. Some cleaning agents that contain more than 5% Methonal can attack the glues for the threads holding the pinstriping brush hairs to the wooden handle, in simple terms, Methonal can ruin the brushes. After a good cleaning, store brushes used in oils or solvent in Brush Oil to keep the hair relaxed and to prevent any paint that is trapped in the hilt/ferrule of the brush from drying. Brush oil can be cleaned out with Mineral Spirits, Turpentine and if need my may use Laquer thinner before using the pinstriping brush the next time. Listed below you'll find a variety of different Pinstriping brushes links, just click and follow the links to the different styles available. If you still need help call us for assistance. Xcaliber Pinstriping Brush Size 0XCaliber Pinstriping Brushes are special due to thier short hair length. Only 1 1/2" vs. the average 2" and 2 1/4..
Xcaliber Pinstriping Brush Size 00Xcaliber Pinstriping Brushes are special due to thier special is it's short hair length. Only 1 1/2" vs. the ave..
Xcaliber Pinstriping Brush Size 000XCaliber Pinstriping Brushes are special due to thier special is it's short hair length. Only 1 1/2" vs. the av..
Xcaliber Pinstriping Brush Size 0000What makes the XCaliber special is it's short hair length. Only 1 1/2" vs. the average 2" and 2 1/4". This sho..